An Chraobh Rua, Dungannon recognised the lifelong contribution to the Irish language during a special ceremony. 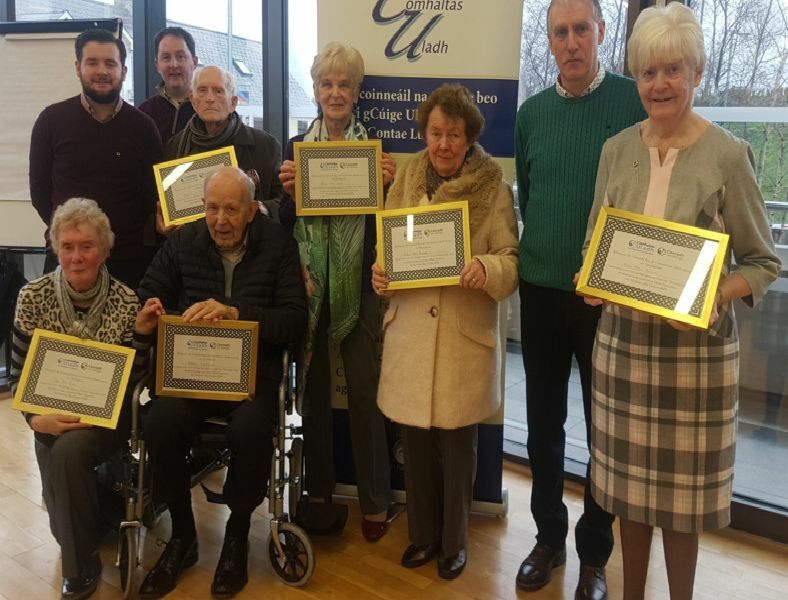 Founded in St. Patrick’s Hall, Dungannon in 1907, the local branch of national Irish language organisation Comhaltas Uladh de Chonradh na Gaeilge presented certificates to long standing members in recognition of their work over many years in promotion of the Irish language in the Dungannon area. �ine N� Riain receiving her certificate from Chairperson of An Chraobh Rua. Helen Mhic Ruair� receiving her certificate from Chairperson of An Chraobh Rua. M�ire Mhic �anaigh receiving her certificate from Chairperson of An Chraobh Rua. �amonn " Doibhlin receiving his certificate from Chairperson of An Chraobh Rua.